All the alcoholic drinks need the intoxication description added. Deleted image. Can you provide a new screenshot of this item please? Added. This drink promises PAIN ! I'll say it once so everybody will know, Brut Champagne is USELESS except as an alcoholic drink. It's not required for any recepy or quest. The only use for it is to build up your alcohol tolerance. 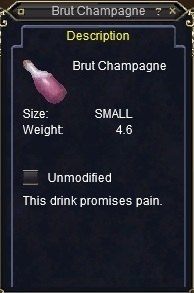 Don't confuse it with DEMI-SEC Champagne required for a Tunare druid epic. So there's no point paying 50PP to buy it from traders in Bazaar... If you want to get drunk there's cheapest ways like Bog juice or Jumjum spiced beer.